This tract is a good way to give away as gifts or a nice addition to a gift. The second reason is to ask you an important question. Do you consider yourself to be a good person? Let's look at the Ten Commandments and see if you are. Have you ever told a lie? Have you ever stolen anything? (The value of the item is irrelevant). Have you ever used God's Name in vain? Jesus said, "Whoever looks upon a woman to lust after her has committed adultery with her already in his heart." Have you ever looked with lust? Will you be guilty or innocent on the Day of Judgment? Will you go to Heaven or Hell? If you are guilty of breaking those four, God sees you as a "lying, thieving, blasphemous, adulterer at heart," and the Bible makes it clear that you will end up in Hell. But there is good news. Even though we broke God's Law (the Ten Commandments), He became a man to pay the fine. Jesus suffered and died on the cross (taking our punishment upon Himself), then He rose from the dead: "For God so loved the world, that He gave His only begotten Son, that whoever believes on Him should not perish, but have everlasting life." God doesn't want you to go to Hell. He can forgive you and grant you the gift of everlasting life, so confess your sins to Him right now, put your trust in Jesus, and you will pass from death to life. The third reason for giving you the money is to show you that you have faith. Perhaps you are saying, "How can I know if the gospel is true?" 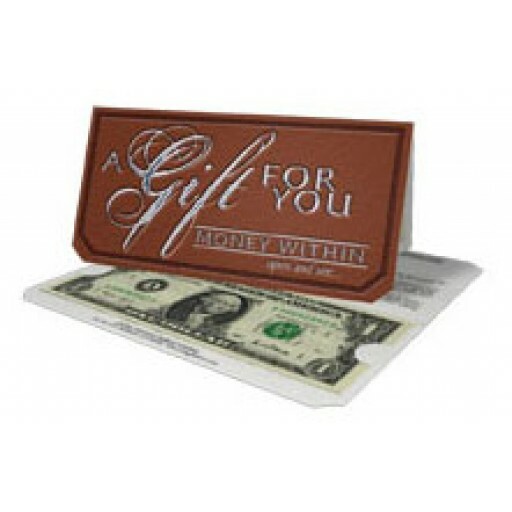 Maybe you felt the same about this gift, but you had enough faith to open it and see if money was inside. Do the same with the gospel. This gift was mere money. God's gift is everlasting life -- so what are you waiting for? You may not have tomorrow . . .
Pray something like this: "Dear God, today I turn away from all of my sins (name them). I put my trust in Jesus Christ as my Lord and Savior. Please forgive me, change my heart, and grant me your gift of everlasting life. In Jesus' name I pray. Amen." Then read your Bible daily, and obey what you read (see John 14:21). Go now to www.livingwaters.com and click on "Save Yourself Some Pain." There you will find important principles that will help you grow in your faith.